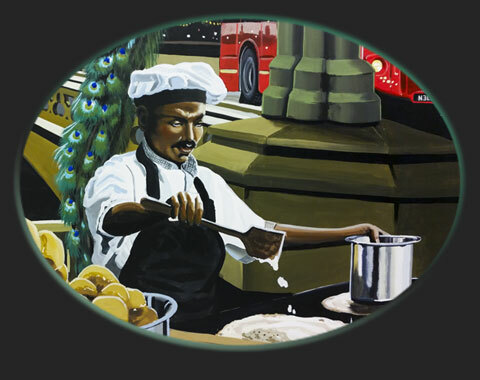 The mural was painted by hand, directly on to the wall in a brand new restaurant. food in Hounslow High Street. It's a busy area with bustling streets so the idea for this mural, thought up by the charismatic entrepreneur owner, brings iconic images from both Indian and English culture together in a busy scene. Bus number - Om, Destination - Love. This mural was painted to generate a chatty atmosphere in a new fast restaurant serving Indian/English hybrid food in Hounslow High Street. It's a busy area with bustling streets so the idea for this mural, thought up by the charismatic entrepreneur owner, brings iconic images from both Indian and English culture together in a busy scene.